Ladybug beetle courtesy of Free Public Domain Photo Database: Ladybug on a leaf. Ladybugs exist in all of Ohio's eighty-eight counties. According to the Ohio General Assembly's resolution: "The ladybug is symbolic of the people of Ohio -she is proud and friendly, bringing delight to millions of children when she alights on their hand or arm to display her multi-colored wings, and she is extremely industrious and hardy, able to live under the most adverse conditions and yet retain her beauty and charm, while at the same time being of inestimable value to nature." The "ladybug" is actually a ladybird beetle (also called lady beetle, ladybird, or ladyfly). Ladybugs help gardeners and farmers by eating tiny insect pests that damage plants. 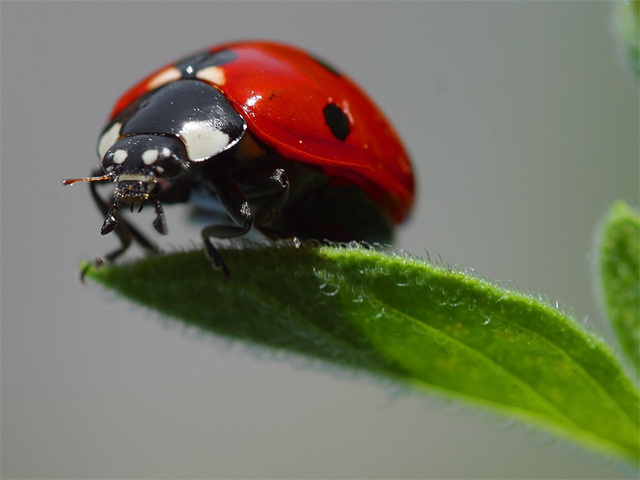 A ladybug can consume up to 60 aphids per day, and will also eat a variety of other harmful insects and larvae (including scales, mealy bugs, leaf hoppers, mites, and other types of soft-bodied insects), as well as pollen and nectar. New York, Massachusetts, New Hampshire, Tennessee, and Delaware also designate the ladybug as an official state symbol (see list of state insects for all 50 states). According to John Losey, a Cornell University entomologist who leads the Lost Ladybug Project. (a project funded by a National Science Foundation grant recruiting citizen scientists, particularly children, to search for nine-spotted ladybug and other ladybug species and send photos of them to Cornell for identification and inclusion in a database), there are about 5,000 species of ladybugs (ladybird beetles), with about 450 species in the United States.